One of the questions I’m most frequently asked in Korea is, “How old are you?” Korea has very strong roots in Confucianism, therefore seniority based on age is very prevalent not in just people’s relations with one another but also in companies, schools and sports teams. Even if the age difference is only one year, the younger person is expected to respect to their elder through speech, body language and gestures, no matter what. I still find myself in a state of shock when Ahjummas (older Korean women) literally push, shove, and elbow their way through a crowd or step in front of you not just in line, but when you are actually at a ticketing window, despite the fact that you might be midway through a transaction. When taking a look around after witnessing this, however, no one bats an eyelash at how rude those actions may be. It’s just the way it is. You’ll see younger people bowing to their elders and addressing them with certain titles and formal language to distinguish rank. It is also customary to pour drinks for those older than you and to let them eat, sit and stand before you as well. Unfortunately (at least that’s they way I see it) this ranking system plays a very large role in the business world as well–positions, pay and ranking almost always go hand in hand with age, regardless of experience. Adding to the complexity of Korea’s hierarchical system is the difference between Korean age and Western age. Koreans believe you are born at age one (that’s a really long pregnancy…) and they do not use their birth date to determine when they turn a year older. Instead, everyone turns one year older the first day of the new year, January 1. I have not been in Korea to ring in the new year yet, but I wonder if it feels like one giant birthday party? I turned 30 not long after arriving in Korea, which means I was actually already 30 in Korean age when I got here and am now 31…I think I’ll stick with Western age. However, I usually get a surprised response when I reveal my age, which I’ll take as a good thing. Upon meeting my co-teacher for the first time after she asked how old I was, she responded, “Oh, wow. Westerners usually look old, but you don’t. You must eat a lot of vegetables.” Yes, I do. And I think the kimchi is now helping out as well. 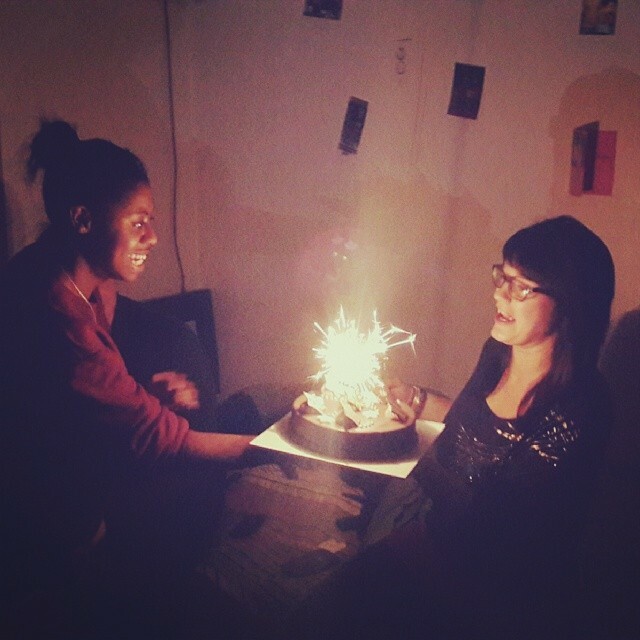 Some friends surprised me with a cake topped with sparklers for my 30th birthday in Korea. And just remember this fun thing: every decade gets better!